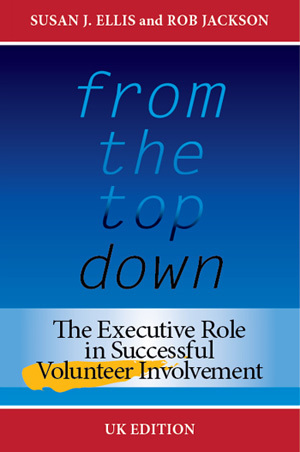 September has arrived and so has the promised new UK Edition of From the Top Down: The Executive Role in Successful Volunteer Involvement. 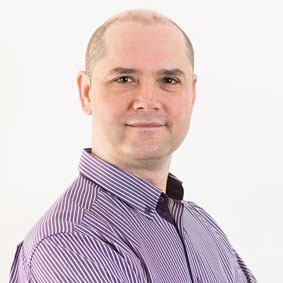 Rob Jackson has reworked Susan Ellis' original content for relevance to volunteering in the UK. Not only has the vocabulary and spelling been converted to British usage, but the chapters on financial reporting and legal issues pertaining to volunteers have been completely rewritten by English authorities. To the right is a brief excerpt from the book, offered as the Tip of the Month. For readers in the UK and most of Europe, the new paperback and Kindle editions can be purchased through Rob's Amazon.co.uk store. For colleagues in Australia, New Zealand, Singapore, India, and other countries using British rather than American English, the paperback or PDF is also available through the Energize Online Bookstore. The Kindle is available on Amazon in the following countries: Germany, France, Spain, Italy, Netherlands, Japan, Brazil, Canada, Mexico, Australia, and India. For anyone wanting the 2010 American edition (3rd ed., written by Susan only), go here. Susan is crossing the pond right now to join Rob for a multi-city tour to celebrate From the Top Down - UK. Events are planned from 7 to 17 September in London, Manchester, Sterling, and Belfast. See the schedule and registration information at the Rob Jackson Consulting Ltd Web site. We offer Canadian cartoonist Graham Harrop's delightful book, Things We Love about Volunteers, in electronic form in our bookstore. Now Harrop celebrates volunteers with a printed desktop calendar - perfect for the holidays! Keep your appreciation of volunteers visible all through 2016 with this charming and practical gift. Ordering information. Volume XV, Issue 4 of e-Volunteerism, our international, subscription-based journal for informing and challenging leaders volunteers, is in full swing for this quarter. Political Volunteering: Lifeblood of Healthy Democracy (Vol. II, Issue 3, April 2002) - Debbie Macon, a fellow volunteer resources manager who has also been an elected official in American local government, shows how interconnected political volunteering is with other volunteer worlds. Volunteer Hounded to Death by Fundraisers? Lessons To Learn - Was Olive Cooke, a 92-year-old volunteer for the Royal British Legion, hounded to death by fundraisers this past May? Intrepid sleuths Susan J. Ellis and Rob Jackson turn the case inside out and use it to debate: What is or should be the connection between donating money and donating time? Leader as Coach: Sustaining the Engagement of Your Volunteers - American author Barry Altland stresses the value of genuine, personal coaching and mentoring in drawing out volunteer passion, and offers practical techniques for doing it right. Volunteer Engagement as a Form of Transformational Leadership - Our new Training Designs Editor, Canadian colleague Erin Spink, explains her proposition that volunteer engagement is a form of transformational leadership because we bring about significant change. Community Mental Health Programmes and Volunteers - This Along the Web from Arnie Wickens in the UK highlights projects around the world in which volunteers support people with mental health illnesses and related issues. Two more articles to go in this issue: a look at the rise, fall and evolution of the "telethon" and a review of research questioning whether volunteer satisfaction increases motivation to do more. to e-Volunteerism for a full year or for 48-hour access. Note that subscribers have full access to the Archives of all 14 previous volume years. Excerpt from From the Top Down - UK Edition by Susan J. Ellis and Rob Jackson (Energize, 2015), pp. 86-88. Even with one or more full-time staff leading volunteer engagement, it's at the front line that the majority of volunteers will need support or, at minimum, someone to provide information. The larger your organisation, the more critical it becomes to designate an official liaison from each department, work unit/team, or physical location to be the point person for volunteers assigned there. Unfortunately, we have all grown accustomed to the ubiquitous presence of automated voicemail systems [which]...for prospective volunteers may be an unhelpful hurdle to jump in the process of considering whether to give time. At a minimum, test the system to make sure that contact with the volunteer office is a specific option to select and that it is easy to leave a message - not to mention ensuring that a staff member calls back soon! One other staffing point is that the director of volunteer involvement is not a substitute for volunteers. If a scheduled volunteer is absent for whatever reason, it is not appropriate to expect the director of volunteer involvement to go to the team and handle the volunteer's work for that day. This is, of course, no different from expectations we hold for employee supervisors. If an employee is not present, the work is generally held until the person returns; the supervisor does not step in to do it unless some emergency warrants this. Actually, since volunteers are deployed in the organisation in various work areas, if a task assigned to an absent volunteer is critical, the most appropriate substitute would be a line worker in that team - not the director of volunteer involvement, who is not part of the team.